Beautiful colors! Bigger than expected. Got it in 2 days! Friends liking it! I love it! Weight 30 - 49.9 lbs. Dimensions 118.0 In. X 118.0 In. X 101.0 In. I simply love this canopy party tent. The colors on the flag are beautiful. It's perfect for my deck and great for the night time with the mesh. My kids get to sleep under at night with friends. Great to have!!!!! LOVE LOVE LOVE this popup canopy. It was a gift for my husband for fathers day. He does alot of grilling. Trying to do some compatitions. Sure will be different. This is the first one I'v ever sene with the USA flag. The side walls will be really useful. A great shelter to ensure the grill and kegerator remain out of mother nature’s grasp. 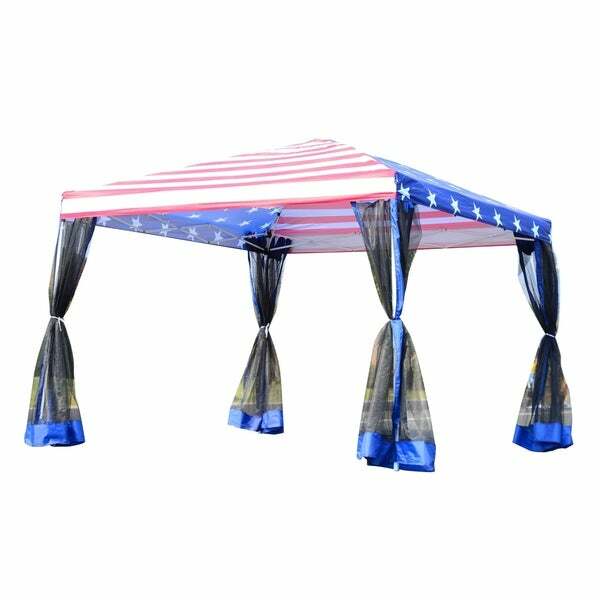 It also provides much needed shade for the grill master and bar keep on those occasional sunny days here in Washington. Great value. Received fast and excellent condition. Finally used it this past weekend... Friends and family loved it and asked where I got it. This canopy was a great purchase, all our guests loved the American flag theme, it was easy to set up and to take down. The screened walls were an added bonus. Glad I got one before they sold out! Love this canopy. Mesh walls aren’t attached so you have to attach them with Velcro loops. But it’s super easy. 2 weeks after I got the canopy one side collapsed and broke into my pool but they INSTANTLY sent me out another one without even using my replacement plan since it was within 30 days. They handled it super quick and professionally and I was impressed. Great for any patriotic person who loves camping! Seems to be good quality but havent fully set it up yet but i will for sure suggest to friends and family. I didn't set it up yet, I order this tent for the deck patio, Box come half open, I am not sure if all the pieces are there. Really can't set up now, due to weather condition and snow. Not happy with the shipping and delivery. True purchase 10 min setup, looks really nice ! This worked out great. We love this product and will probably buy another one. ‘Merica! How great is this thing? Going to be way easier to track this tent down in a sea of plain white ones... The netting sidewalls are just an added bonus. Worked good but needs legs weighted. Gusts of wind caused it to leave ground. Unable to use spikes as our display area was in black topped parking lot not on grass.